Modulation method. The amplitude of an AM signal carrier varies according to the modulating signal. The nominal bandwidth of an AM signal is twice that of the highest frequency contained in the modulating frequency. 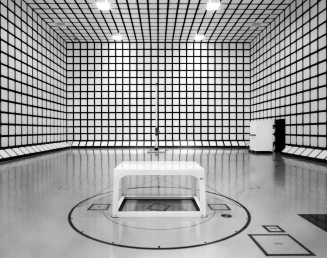 A test room lined with EM-absorbing material to reduce the reflection of electromagnetic waves. A fully anechoic chamber or FAR is designed to simulate a free-space environment. It should have absorber material on all surfaces, including the floor. A semi-anechoic chamber or SAR should have absorbing material on the walls and ceiling only. The floor should be without absorbing material so that it is reflective to create a ground plane effect. The SAR is the indoor version of the Open Area Test Site. An antenna is a electro-mechanical transducer through which electromagnetic waves are coupled from a transmitter cable to space and from space to a receiver cable. Antenna directivity (maximum or peak gain) is a measure of how well an antenna radiates in its intended direction as compared to an isotropic radiator. 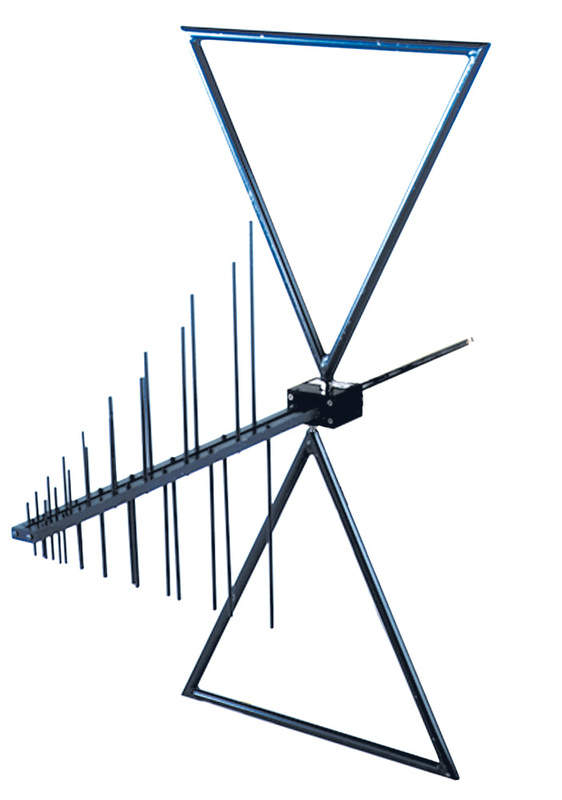 An omni-directional antenna provides equal radiation levels in all directions. Antenna gain is the dimensionless factor of reception of an antenna in the presumed direction, compared to that of an isotropic radator and is expressed in dBi. 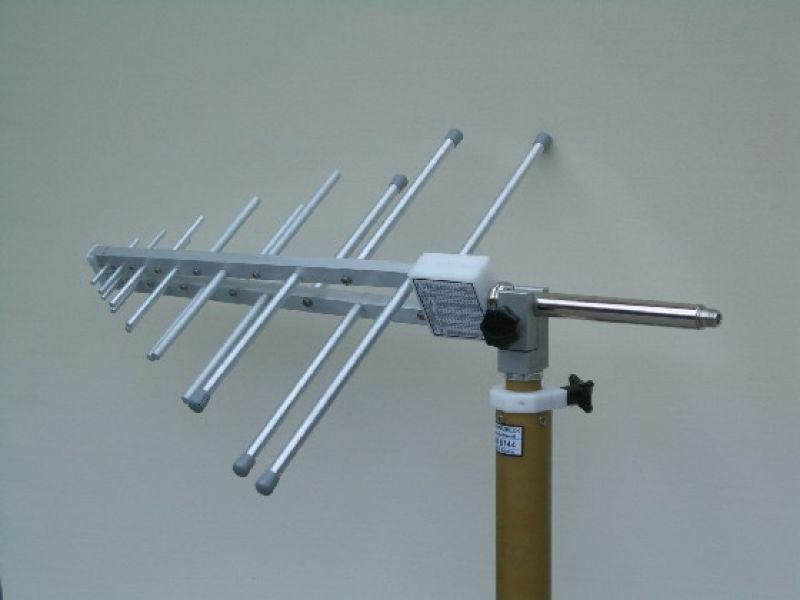 A quarter lamba antenna exhibits a gain of 3 dBi where high performance antennas such as yagi's can attain up to 30 dBi. Note that the increased sensitivity is at the cost of reduced sensitivity in other directions. Antennas exhibit different feed-point impedances (resistive + reactive components), depending on their design, proximity to surrounding objects, and height above ground. A full wave folded dipole has at it's resonance frequency an impedanze of 300+0j Ohms. At lower frequencies impedance becomes mainly capacitive, where at higher frequencies the antenna impedance gets inductive. The polarization of an electromagnetic wave is determined by the orientation of the electric field (E) vector with respect to the direction of wave propagation, for a horizontal dipole antenna the E-field is horizontally polarized. Any opening in a metallic enclosure that exhibits emissions due to surface current surrounding the slot, hole or joint. The quotient of output voltage versus input voltage of a filter, attenuator or any other 4-pole circuit. Attenuation is most often expressed in dB. The average detector is characterized by equal charge and discharge time constants resulting in readings of the average voltage level of the measured emission. A measuring receiver reports the maximum signal output by the detector during the measurement time. Within the discipline of EMC the average detector is defined by CISPR16 to have an averaging time constant of 100 mS. See also peak detector and quasi peak detector. A broadband linear polarized dipole antenna used to measure and produce electric fields from approximately 30 MHz to 300 MHz. Basically this is a "fat" half wave dipole. Due to the increased capacitive component of the dipole elements, the quality factor of the design lowers, and so becomes wideband. A combination (hybrid design) of a biconical and a log periodic antenna with a build-in crossover network. It may have a frequency range of ultimately 26 MHz to 2 GHz. To provide a fixed connection between two metallic objects that results in reliable electrical conductivity between them. The connection may occur either from physical contact between conducting surfaces of the objects or from the addition of a firm electrical connection. Within the filed of electrical safety the term bonding refers to reliable grounding or accessible conductive parts. The bonding needs to result in a ohmic resistance genarally lower then 100 mOhms and neet to conduct 25 amperes reliably. Ground bonding is verified during an electrical safety test. An term for harmonic emssions of which more then one emission harmonic fall within the bandwidth of a measurement receiver, so as that no individual harmonics can be distinguished anymore. Standard emission measurements use a receiver bandwidth of 120 kHz, so the source of broadband emission must have a repetition frequency below 120 Khz for this to happen. The energy distribution of broadband emissions is expressed in dBuV/MHz. The process of ce tests leading to a ce certificate, showing compliance with all applicable directives. The antenna is designed to radiate and receive electromagnetic waves where the E-vector rotates with time along the direction of wave propagation. Circular polarized antennas are polarized by the physical structure of their radiating aperture, such as the spiral and the helix. Right-hand (R-H) and left-hand (L-H) polarization are determined by the screw sense of these designs. Antennas with orthogonal elements that are combined in phase quadrature such as the crossed dipole with external 90 degree hybrid coupler can produce right-hand and left-hand circular polarization simultaneously. Signal/current identical in phase and amplitude in more than one in- output. Mathematically when the sum of signal in a wire system (cable) <> 0 we speak about common mode. For normal signals the sum of signals/currents is 0. Common mode signal often have ground/chassis as return path and are them main cause of radiated emssions. A range of 1 - 10, or 100-1000, such as 1V - 10V or 1000-10000 Hz. Expressed logarithmatically that is 20 dB. Logarithmic representation of a ratio measurement. Although it expresses the ratio of two power levels, it may be used for other (electrical) ratios. It is most commonly used for expressing power, voltage and current ratios as follows: Power Ratio dB = 10 log (P1/P2), Voltage Ratio dB = 20 log (V1/V2), Current Ratio dB = 20 log (I1/I2). Not that a factor 2 equals 6 dB for voltage and current and 3 dB for Power (approx). The decibel is also commonly used for sound power levels although that must be dBpW officially (level above 1pW) . Referenced against 1 mW into 50 Ohms, the 0 dBm is a common referencr level in RF engineering. Interference characterises itself as differential mode (DM) when the sum of the interference currents (Idm) in all leads equals 0. The difference is called Common Mode (if not zero). DM interference is not easy to be distinguished from signal current. The interference caused by DM currents is limited, as the fields from adjacent leads in a cable tends to cancel out. Antenna of which the radiation properties are defined by physical dimensions close to half or a quaerter of a wavelength. Radiation impedance at resonance is 50-73 Ohms for open dipoles, and 300 Ohms for folded dipoles. The potential gradient of a radiated (planar) wave measured in volts/m. Between two conductive layers, 1 meter spaced, a connected voltage of 1V will create a field strength of 1V/m. Any radio wave consists of 2 components, an E-field (electric) component and a H-field (magnetic) component. The two are connected by the field impedance Z=E/H. The E-field charaterzies itself by having a capacitive behaviour and by having a high field impedance. The capability of equipment or systems to be used in their intended electro-magnetic environment within designed performance levels. A transfer of electric charge between bodies of different electrostatic potential in proximity or through direct contact. One of the essential tests carried out on equipment for ce immunity. We distinguish 2 kind of discharges, AIR discharge and Contact Discharge. The former method creates a discharge by quickly approaching EUT until the discharge happens, the latter method brings the discharge gun in contact with the (conductive) surface of EUT and the discharge is generated inside the discharge gun using a vacuum relay. Common voltages are 4-6-8 kV. A theoretical radiator that radiates equally well in all directions, bot horizontal over 306 degrees as vertically 360 degrees. A isotropic radiator cannot be build, but is widely used to compare real life antennas with. The antenna is designed to radiate and receive electromagnetic waves where the E-vector remains in a straight line as it moves in the direction of propagation. These antennas may be oriented or designed for horizontal or vertical polarization. Detector for the AM modulation of the IF signal received by a measuring receiver. Measures the actual peak value of the signal as fast as limited by the bandwith of the IF system, in most EMC measurements 9,120 or 1000 KHz wide. Holds the peak value as found during the measuring time (dwell time) of the receiver. The precise specifications of an EMC peak detector are covered by the CISPR 16 standards. The quasi peak detector is characterized by controlled charge and discharge time constants along with controlled predetection bandwidths to provide weighted readings corresponding to the type of signal measured or the EMI degrading effects. This method is used by CISPR stndards and adopted world wide. Quasi-peak detectors weigh signals according to their repetition rate, which is a way of measuring their "annoyance factor." 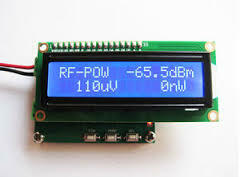 In a common VHF-UHF EMI receiver a charge time of 1 mS and a discharge time of 550 mS is used. A measuring receiver reports the maximum detector output level during its measurement time. The RMS detector provides readings that are proportional to emission signal power at the detector's input.